Hi guys! I'm super excited to be teaming up with Clean Coasts at Sea Sessions on Sunday for a beach clean as part of the festival and doing a take over of their insta and fb. Clean Coasts is part of an Taisce and their mission is to engage communities in the protection of Ireland’s beaches, seas and marine life. 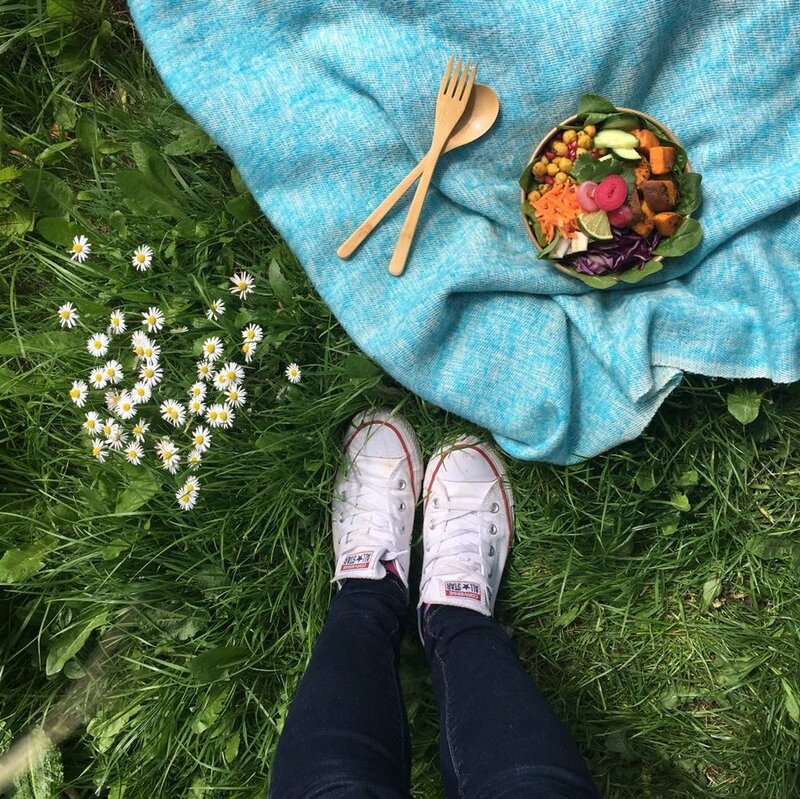 On the run up to the festival we wanted to share with you guys some super simple tips on how to do your festival season plastic free. Since Sea Sessions is slap bang on the coast it is the perfect festival to showcase how to attend a festival plastic free and also to highlight what happens when we don't - as we might well see on Sunday's beach clean. So you might be the free spirit festival goer or the ardent overpacker (that’s me, I literally bring my house to a festival in a van), but either approach here are some super simple ways to reduce (or totally cut out) single use plastics at a festival. Water bottle - super simple one a steel water bottle will keep your water cold (heaven on the morning after the night before), wont smash like glass and doesnt have the nasty leaching of plastic. Coffee cup - I usually use a glass travel mug, which is of course a no-go for a festival, but the little bamboo ones are nice and light. If you dont want the extra bits to carry you could do like Amore Sorelle and rock a metal cup on your belt, hands free and great for coffee and boozy beverages alike. Cutlery - I carry around a little bamboo set in a with pouch (which I added chopsticks too), so handy for any festival backpack, light and easily cleaned. BYO bag o’cans - love this mesh bag I got in australia as it folds up really small, but can hold not only a few cans, but also your jumper if it gets warm. Plastic bags really are enemy number one when it comes to single use plastics in my mind. Theyre so readily handed out, so easily broken and before you know it theyre blowing into the ocean! I took this photo a while back to highlight my self-made/plastic free as possible travel toiletries, but the bag doubles for a bag o'cans and also top tip for the ladies - lavender essential oil is what I use for perfume, that way you dont get your lovely fancy glass perfume bottle taken off you! Bring a rain jacket (so you dont end up with a crappy plastic poncho). Also its Ireland. Bring a rain jacket. For those determined to go a little more die hard I challenge you to…. Try a bamboo toothbrush (like the one in the pic above) - think of the number of toothbrushes we use each year, then think of our lifetime. The brushes probably last longer then we will have teeth! A bamboo swap is light weight and easily done. Try a shampoo bar in a metal tin (also above, orange bar in the tin)- washes your whole body, smaller then a shampoo bottle and wont spill either. Say no to the baby whipes - say WHAT, yes who knew, not just the bag, but even the “cloth” has plastic in it! If you have any of those little travel spritzer bottles, I fill one of those with rose water (super cheap at any ethnic market) and bring some cotton make up pads in my toiletries bag. Beautiful smell and freshens you up no bother! Say no to single use plastics - straws, cutlery, unnecessary plastic bags, forget the glow stick (just paint your face instead!). Give your love (and your moolah!) to the companies doing their bit to reduce plastic consumption through reusable items, minimal packaging and those using cardboard, paper, tinfoil and vegware! Say YES to companies that serve your food or drinks in reusable containers/BYO lunchbox - and NO to those who try to give you plastic bags and styrofoam containers. When I was at EP last year I paid a deposit on a vegaware style glass that I could use for the weekend and then return or keep as a souvenir. Lots of companies are great now for serving their food in cardboard, tinfoil and vegware, all still single use but much more easily recycled then plastic (and in the case of paper less harmful to the environment). Take your tent away with you or if it got wrecked some folks often take them for art projects, if you smoke put the butts in the bin, if you see a can or bottle on the ground, sure be sound and pop it in the bin. BONUS TIP - choose snacks that naturally come without packaging - like fruit - bananas are great for a delicate stomach the next day. Nature has already wrapped it for you. You're welcome! To find out more about what'll be going on with Clean Coasts over the Sea Sessions weekend check them out on Instagram at @cleancoasts ! !